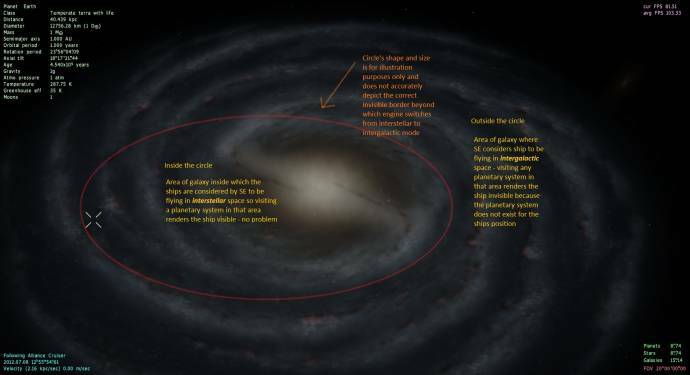 Is there any progress regarding this issue: http://en.spaceengine.org/forum/4-705-8384-16-1343663032 ?? Did you teleport ship inside the planetary system and is the time unpaused? I myself have tested teleporting a ship inside a system, time unpaused, and moving the ship away from the star and observing at what point the engine switches to "interstellar". Only maybe 20 AU away the ship disappeared and switched to interstellar mode. I tested if a few times, same result. I did not test it on many different systems, but there are certainly some issues regarding this. Space Enginneer, yes the game is unpauded at all times. XMINEIROCREEPEIROGENERALX, posting a seemingly irrelevant emoticon in a thread is considered spam and is not tolerated. If you don't start abiding by the rules and making sensible posts, you may eventually lose your privileges of posting on this forum. Hello, i was patching the space engine, to 0.9.6.2 and a strange thing hapened. al the planet was on water. just the tallest mountain where appearing. I turned of the water, and all ok! But i want water in other planets! I knew that this will hapen in the patch . AM VERY ANGRY! LOLZ Not with you guys lolol WITH EARTH! I fixed it easily by selecting Earth, pressing ESC, going to Editor and then Edit Planet. Half way down the list is the slider marked seaLevel. Drag it a little one way or the other, and the landmass should reappear. Then click Update at the top, and Close. Thanks man! im playing with the seaLevel sinking the planet! Did you delete the cache folder when installing the patch? It's very obscure no? Is this a bug? XMINEIROCREEPEIROGENERALX, you should not make double posts. If you want to add something a few seconds after you post, edit your previous post. And this has been mentioned many times before. Please use the search function. The very beginning of the bug reports thread (where I have moved this to) has the same issue mentioned.